Saturday, September 13, we had the last performance of the O Best Beloved 2014 tour at Adam Sussman’s Parker Street Odditorium — and it was fantastic! Much to the surprise and delectation of all assembled, at the end of the show, two galant strangers stood up to announce that the production had been awarded an Awesome Foundation AWESOME GRANT for $1000 and presented directors Joan Howard and Rebecca Longworth with the prize in LED lit suitcase complete with branded sunglasses! — with Joan Howard andRebecca Longworth. And indeed! 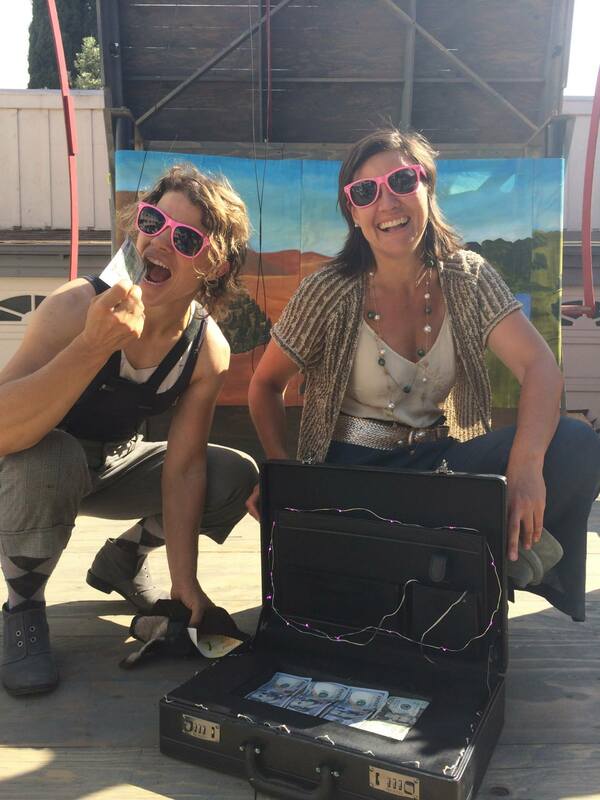 Board members of the San Francisco Awesome Foundation surprised us with a glowing briefcase full of dollars after the show! We’re proud, elated, and really really grateful to be awesome. Joan and Rebecca had to don shades to take in the awesomeness of the Awesome Foundation’s generous grant! ← One more chance to see O Best Beloved on Tour! Wow, this is so, you know, AWESOME! Congratulations Joan, Rebecca & all the talented & worthy artists!